Clarkson Real Estate – Bromsgrove Rd. 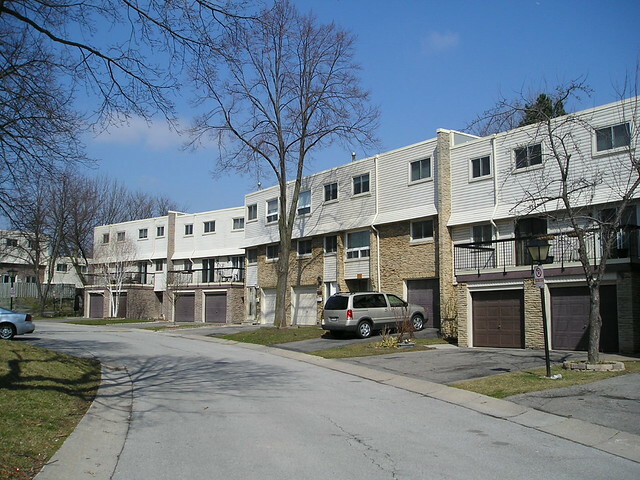 One of the more popular starter home locations in Mississauga, Ontario has been the Bromsgrove Road townhouses, situated in the Clarkson area area of the city. These affordably priced condo townhouses in Clarkson were originally built in the 1970’s, but have remained popular due to their ideal location: very near to the Clarkson GO station, and with access to the QEW highway only minutes away. They are also located very near to the Clarkson Community Centre, with its many facilities including swimming pool, as well as the Clarkson Library. The townhouses of Bromsgrove Road have increased steadily in price, but are still within reach of many first time buyers. One other benefit is the close proximity of schools – Clarkson Secondary School, for example, is located right on Bromsgrove Road, and is only a few minutes walk from these townhouses. There is a Mini-Skool for pre-schoolers daycare which is also located on Bromsgrove Road, and there are several Public and Catholic elementary schools such as Willow Glen and St. Helen that are a short walk away. What’s important to know is that each townhouse complex along Bromsgrove Road is different – there are differences in the amenities and parking facilties of each complex, and condo maintenance fees vary from location to location. Most are two storey buildings with basements, although there are a few three storey locations. Before we look at the sale prices of these Clarkson townhouses, here are a few words about some of the individual complexes. 2170 Bromsgrove Road is located at the eastern most end of the street, closest to Southdown Road and the Clarkson GO Station. It is also unique in that it features some stacked townhouses with semi-underground parking (open double parking spots, like a carport). 2170 Bromsgrove Road is the lowest price complex on the street, even though the units are quite large. There are other units here which feature surface parking. 2340 and 2380 Bromsgrove Road are adjacent to each other, and are located on the south side of Bromsgrove Road. Many of the units in these two complexes have been substantially updated, although some still have electric heat. Each address has a mix of 2 and 3 storey units. 2315 Bromsgrove Road is a very popular complex – located on the north side of Bromsgrove Road, tucked away somewhat from the traffic and also from the GO train tracks which run south of the street. One unique feature of this complex is that many of the units have a balcony terrace walkout from the master bedroom. 2395 Bromsgrove Road is also very popular, although it features a mix of single car garages, and some units with surface parking. This is a long, rambling complex with many mature trees, and the buildings are all brick with distinctive doorway arches over many of the units. 2440 Bromsgrove Road is a large complex situated on the south side of the street, and this complex features an outdoor pool. There is a mix of 2 and 3 storey units, and each has a single car garage. 2687 and 2688 Bromsgrove Road are two small complexes situated at the extreme western end of the street, at Winston Churchill Blvd. They are right next door to the executive homes of the Oakville Clearview neighborhood. These two complexes are highly sought after due to their smaller, intimate appeal. Get to know the neighborhood! See elsewhere on my site for photos and prices of all the Bromsgrove Road townhouse complexes. Interested in Bromsgrove townhouses for sale or rent? There are always new MLS listings coming out for these popular Clarkson townhomes, on an almost weekly basis. Find out which townhouses are for sale or rent, by calling us direct at 416-433-3556 or simply click here . You will get instant help, and it’s free! If you own a townhouse on Bromsgrove Road and are thinking of moving, just let us know – we have a very strong marketing plan which results in getting your home sold fast, and for top dollar. Before we start, we provide you with an accurate, comprehensive home evaluation so you’ll know exactly what the numbers will be when you sell.